I was at work on the 19th of February when I came across an article from the People's Democratic Party chieftain and former Minister of Aviation; Femi Fani-Kayode titled ''Who has bewitched the PDP?'' It was a deviation from the usual articles portraying his obsession with Buhari under the guise of criticisms. I swiftly saved the link to the article and set a reminder to read it at my free time on Saturday due to the workload I was dealing with at the moment. The linkage between Boko Haram and politics in Nigeria is an informal research project I have followed since the ill-fated attack on the United Nations headquarters in Abuja killing 11 UN staff and 12 others with about a 100 others injured in August, 2011. As a Writer, I felt the tears and blood dripping from Fani Kayode's pen calling for a reason to focus more attention. His article centred around the emergence of former Borno state Governor Ali Modu Sheriff as the Acting Chairman of the PDP with a herculean task to fix the broken foundation of the party after the historical loss of its incumbent President, Dr. Goodluck Ebele Jonathan to the current ruling party presidential candidate, President Muhammadu Buhari of the All Progressives Congress, APC. I salute the audacious move of Fani Kayode and for once, I waived the controversies trailing the politician who has in the past shuttled between the PDP and APC without conscience till his supporters got lost in transit. I virtually read Fani Kayode's piece because it’s a rare confession which the hypocritical 'Twitter Senator' Ben Murray-Bruce, the Chairman of Silverbird group and his cohorts will not dare to in order not to burn political bridges against the future. Anyway, maybe Fani Kayode was compelled to confirm the obvious after most online media platforms broke the news of Sheriff's appointment describing him as an "alleged Boko Haram sponsor'' to boost attention and readership effect which worked perfectly. Sheriff's indictment expresses the high level of selfishness of Nigerian politicians. It delineates the do-or-die mentality of our politicians which has made the Independent National Electoral Commission seem impotent despite the mental work and brilliant innovations invested in the mode of operations of the body to ensure a free and fair electoral process. I am beginning to feel it will take God's intervention of sending his only begotten son, Jesus Christ to Nigeria to come and die for our sins again so that there can be a redirection of affairs according to the biblical perspective screen. Politics in Nigeria has always been a game of the pigs in mud culturally doing it dirty and for many generations to come, I doubt if this will change. An average Nigerian politician may initiate the release of a notorious criminal sentenced to death by the court if he can decimate his opposition. Believing the claims of Fani Kayode for a second, the affiliations of Sheriff to Boko Haram by virtue of his reported closeness to the late first leader of the terrorist group, Mohammed Yusuf who was summarily executed while in police custody, wasn't new to prominent Nigerian politicians. Sheriff was a coveted asset due to the fact that he wields political influence coupled with his affluence. Both qualities are two lethal weapons to win political power which politics entail. APC was the first to woo Sheriff at the foundational stage of the party shortly between 2013 and 2014 from the All Nigeria People's Party, ANPP. Later in 2014, he left for the PDP where his membership is retained till date. To confirm the PDP's knowledge of Sheriff's links with Boko Haram before the exposure by an Australian hostage negotiator, Steven Davies; former President Goodluck Jonathan while on a visit to Borno state in April, 2013 said on camera that Sheriff is Mohammed Yusuf's friend and his audience laughed at the president's insinuation. This hypocritical act took place while Sheriff was with the APC that was desperate for a strong 'political army' to unseat Goodluck Jonathan. The same PDP later accepted Sheriff into the party in 2014 and stood by him when Steven Davies accused him of being having links with Boko Haram in August, 2014. Jonathan even went as far as taking a man of doubtful character like Sheriff to Chad to meet with the president, Idriss Deby for a security meeting concerning the menace of Boko Haram. Isn't that preposterous? Sheriff may not be guilty as alleged but when human lives (national security) are at stake, we should take no chances of loopholes. APC in turn taunted PDP on the allegations levelled against Sheriff to tarnish the image of the party which played out as planned. Setting the records straight, our leaders control the media and they only air what they want the people to know. The exposure of Sheriff's reported links to the sect is just one of numerous cases posterity will judge in due time. Boko Haram's affiliation to the government can be confirmed in the words of the late Nigerian tyrant, Gen. Sani Abacha who said no insurgence can last up to 24hrs without the involvement of the government and today we have Boko Haram detrimentally running into 7 years. The late former National Security Adviser, Owoye Azazi also linked the emergence of Boko Haram to politics. He made this statement in the year 2012, while speaking at a South-South Economic Summit in Delta state. He reiterated that escalation of insecurity in the country, particularly the rampaging activities of the dreaded extremist sect, Boko Haram, is traceable to some undemocratic practices by the political parties during elections, especially the ruling People’s Democratic Party (PDP). This statement controversially led to the sack of Azazi amongst other issues. The words of the popular Nigerian Journalist, Ahmad Salkida who was linked to Boko Haram before he eloped to Dubai where he is currently based also confirms the obvious. He slammed President Muhammadu Buhari's lack of dedication to the liberation of the Chibok girls from captivity after he told the parents of the Chibok girls at the Aso Rock villa in Abuja that he had no Intel about their location. On the 27th of February, 2015 during the heat of the electioneering campaign, following Buhari's appearance at Chatham House in the United Kingdom, Fani Kayode in criticism of Buhari opened a can of worms. He claimed Buhari was nominated as the Spokesman and representative of the Boko Haram sect during a proposed negotiation with the Federal Government. Buhari also openly likened Boko Haram to the Niger Delta militancy. On this note, he made the infamous statement that ''an attack on Boko Haram is an attack on the north''. Doesn't still smell allegiance? It should be noted that this isn't an accusation but questions I wish my readers could join me in pondering upon for answers. I think it’s high time our leaders stopped being diplomatic with the truth as we the masses are the victims of their misdeeds. These few indicators are crystal-clear enough to give us direction to tackle Boko Haram terrorism ideologically rather than engaging in prolonged military fights that have dyed the colour of the north-east sand with human blood. Back to Sheriff and the rise of Boko Haram, the Worldwatch Monitor reveals some staggering details that are pointers to the romance of Sheriff's administration with Boko Haram giving the group an enabling ground to reach its full potentials. Muhammed Yusuf in 2003 once fled to Saudi Arabia when it appeared the notorious activities of his deputy, Abubakar Shekau and his men were endangering him. According to the news plaform, the deputy governor of that time named Adamu Shettima Yuguda Dibal (current APC member) met with Yusuf on Hajj and used his political influence to secure his return. What was the alleged interest of the leadership of the state in Yusuf who returned with a renewed radical preaching style? WorldWatch Monitor also confirms Fani Kayode's statement that Sheriff's alliance with Yusuf provided the financial resources for the sect to grow in strength before it developed out of control. In October, 2012, unconfirmed reports have it that operatives of the Joint Task Force in Maiduguri arrested one Boko Haram top commander, Shuaibu Mohammed Bama at the abode of Sheriff which spontaneously led to denials. Strong links between Sheriff and the sect also angered youths in Borno that they made unsuccessful attempts to set Sheriff's private residence ablaze. All these issues were swept under the carpet and Sheriff was duly accommodated in the PDP simply because politics is a game of numbers like Fani Kayode said. I am sure the currently opposing members of the PDP Board of Trustees sycophantically associated with Sheriff with utmost caution in a bid to benefit from his enormous wealth and political influence in the northern part of Nigeria which didn't work out as Buhari swept the region clean with massive votes. The emergence of Sheriff as the Acting Chairman of the opposition party is a desperate bid for financial sponsorship as well as his reported plan to lure back unhappy APC bigwigs into the party against 2019 general elections. 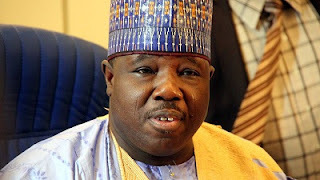 Dramatically, some prominent PDP members are finding it awkward and suicidal presenting a controversial figure like Sheriff as the front man of the party. This level of hypocrisy is disgusting and it pictures the emptiness the PDP has been degraded to since its defeat at the presidential polls in 2015. If Sheriff is good enough as a member of the party which he has been faithfully for about 2 years, then he is equally qualified to be at the realm of leadership of the party with obedience to the principle of equality and fairness. The current outrage and threat of an exodus by some 20 PDP senators and other 50 members of the House of Representatives is a blatant dance of shame. I urge the agitating PDP members to gladly accept Ali Modu Sheriff and let him actualize his plan of returning the party to the presidency in 2019 as its virtually too late to tarnish his image after he has been allowed to strive and gain grounds in the party. It’s funny how the hunters are now being hunted. I feel for Fani Kayode. I salute the daring truths he revealed and I wish I could cry with him but I have exhausted my tears mourning the over 20,000 people killed by Boko Haram in the last 7 years, the 2.6 million Internally Displaced People, the maimed people with permanent physically disabilities, the orphans who have lost their benefactors, the widows, soldiers that bled to death in thick forests with cases covered up to affirm our trust in the army and the constantly raped female victims who have been overwhelmed by the Stockholm syndrome. Fani Kayode should live with the monster the great party nursed to gather momentum within its capacity out of sheer selfishness and desperation to amass votes. They should remember that the choices they make will go a long way in determining the results they will get. His rants smell of lack of shame and the effect of a backfired attack. I sincerely wish Ali Modu Sheriff good luck as he strives to achieve his aims and objectives. For democracy to strive well, Nigeria needs a viable opposition that will serve as a watchdog on the ruling party to curtail its excesses.